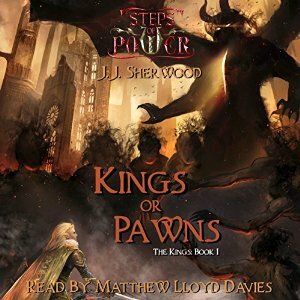 When it comes to high fantasy, author J.J. Sherwood wastes no time in bringing her audience right into the heart of the action in Kings or Pawns: Steps of Power:The Kings, Book 1, ushering in a new saga whose threads of intrigue would challenge even the elaborateness of Game of Thrones. The story takes place Elvorium, the capital of Sevrigel, which, as the name suggests, is inhabited by elves that has been corrupted by terrible leadership for decades. These elves are a far cry from the ethereal, felicitous creatures of Tolkien's world however; these are hard-fighting, hard-partying souls. Indeed, despite having a large cast of characters, Sherwood (who looks a bit elvish herself) takes the time to flesh them out fully and meticulously. Jikun Taemrin for example is one of my favorites with his frosty exterior, his long white hair and "azure eyes" marking him from the north, and yet inwardly he's a big softie. In one of the lighter moments towards the beginning of the novel his friend Navon finds Jikun's journal of terrible poetry which he begins to delightedly recite aloud, much to Jikun's dismay. Navon is a good foil for Jikun's stuffy nature, always encouraging his brother-in-arms to try to live a little...and maybe dabble in the occasional necromancy, which is illegal in Sevrigel. I found the audiobook much easier to dive into than the printed version mainly because of the good-humored way Matthew Lloyd Davies voices the characters in his polished British accent, fostering empathy and successfully interpreting the quick wit that Sherwood imbues within her solid writing. Some narrators have to make a silk purse out of a sow's ear as the old saying goes, but Sherwood is so confident in the tale she has to tell and her sentence structure so spot-on that reading this aloud must have been a true joy. Sherwood also credits her editor, the unsung heroes of the publishing world, on her website for making Kings or Pawns as polished as it is. Davies also has great pacing, speeding up during moments of high tension but generally keeping a measured tone throughout. His crisp enunciation and consistency bouncing between so many different characters also helped me as a listener to keep track of who's who and what exactly is happening. I particularly enjoyed the self-depracating tone he gives Jikun (I had flashbacks to Stephen Fry's vocal interpretation of Marvin, the depressed robot, in his narration of Hitchhiker's Guide to the Galaxy) , which is in direct contrast to Navon's more light-hearted inflections, further highlighting their "odd couple"friendship. Hairem's timbre is posh but uncertain, which is perfectly suited to his situation. This is a mostly male-driven novel and I would've preferred a few more warrioresses sprinkled throughout, but Alvena, the mute handmaiden to Hairem that he has a particular affection for, proves to be an unlikely but essential plot device as the tale begins to weave its intricate tapestry. Jackaroo sez: Audiobook was easier to delve into, but plot picked up quickly. Would've preferred more cats involved, but overall, a solid debut of a new series with excellent writing! Like the sound of this? Enter to win your own signed hardcover copy of the book and other fantasy swag here!